Ferguson officer hog-tying lawsuit: McDonald's policeman accused of aggression toward 12-year-old. The Friendly Temple Missionary Baptist Church, where Michael Brown’s funeral is being held today. One of the Ferguson police officers who arrested a reporter for failing to leave a McDonald’s earlier this month is being sued for allegedly choking and “hog-tying” a 12-year-old boy, the Huffington Post says. (The HuffPo writer who was arrested, Ryan J. Reilly, is co-bylined on the report.) The incident occurred when the officer, Justin Cosma, worked for the Jefferson County Sheriff’s Office. According to a lawsuit filed in 2012 in Missouri federal court, Justin Cosma and another officer, Richard Carter, approached a 12-year-old boy who was checking the mailbox at the end of his driveway in June 2010. … The pair asked the boy if he’d been playing on a nearby highway, and he replied no, according to the lawsuit. Cosma and Carter, the suit alleges, then accused the 12-year-old of resisting arrest and assaulting a law enforcement officer, charges that were not pursued by the county prosecutor. 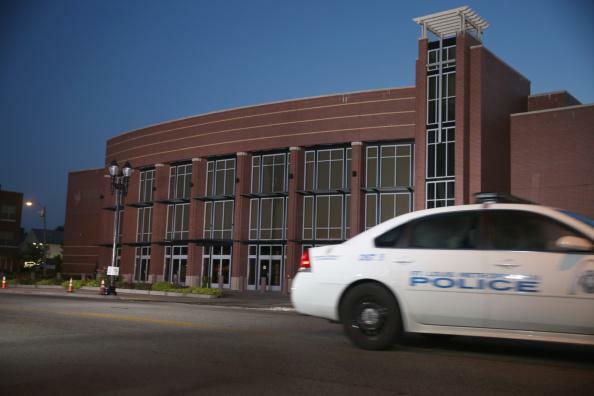 Another Ferguson officer, Eddie Boyd III, left the St. Louis Police Department after credible accusations that he had pistol-whipped a 12-year-old girl and a boy who was a high school freshman, HuffPo reported last week. Read more Slate coverage of Ferguson.